The features of self-organization of densely grafted layers of macromolecules composed of amphiphilic units in selective solvent have been studied by computer simulation. Depending on solvent quality, strands and lamellas with different period can form in these layers, and the rearrangement of some lamellas into others proceeds by the formation of parking garage bicontinuous structure where lamellas with different periods are separated in height and bound to each other via inclined bridges. 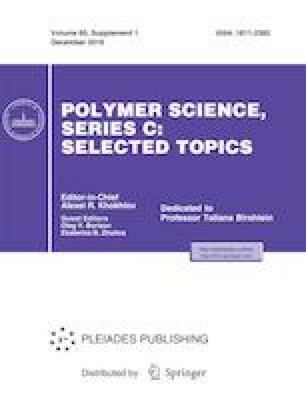 A method of quantitative description of parking garage structure has been suggested, the range of its existence has been determined, and the presence of a hysteresis on the plot of the position of the interface of lamellas vs. solvent quality has been revealed. It has been shown that the formation of parking garage structure occurs as a first-order phase transition with heat capacity maximum. Original Russian Text © A.A. Lazutin, V.V. Vasilevskaya, 2018, published in Vysokomolekulyarnye Soedineniya, Seriya C, 2018, Vol. 60, No. 2, pp. 153–162.